Hey guys, yesterday when I posted that glorious kitchen photo with its chalkboard wall, I realized I never actually shared with you my wall I did about a month ago. I LOVE IT. It combines great with the red and we enjoy it a lot, of course it does NOT look this clean all the time, usually its got plenty of messages and cars and cities and people and other indecipherable doodles. I just love it! 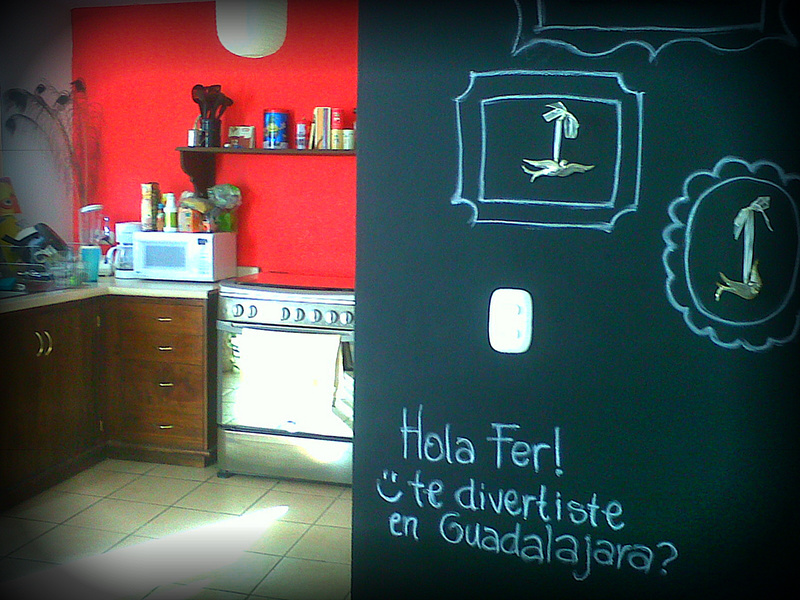 I had chalkboard walls in an old kitchen of mine and I miss them! Hello gorgeous!! Nice timing, I was just logging in to check out my fav blogs and saw your sweet comment. And lastly, boys, boys, boys, boys boys. They can be so stupid. I am surprised at how many really are so controlling and insecure. I have always felt that women are actually much stronger than men emotionally. It's fab! I've been wanting to do this in my kitchen forever! the chalkboard wall is a cool idea!! Cute! So incredibly well done and cute!